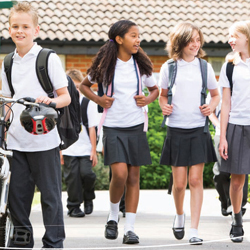 The Welsh Assembly Government has introduced a grant of £105 to assist families on low income with the purchase of school uniform. The grant is available to pupils entering year 7 of Secondary school in September 2011 and those pupils aged 11 on 1 September 2011 attending a special school, special needs resource base or pupil referral unit. The parent or legal guardian making the application must be eligible to apply for free school meals (see qualifying criteria for free school meals by following the link on this page). Information regarding uniform grants for pupils starting year 7 in September 2012 will appear here in May 2012.